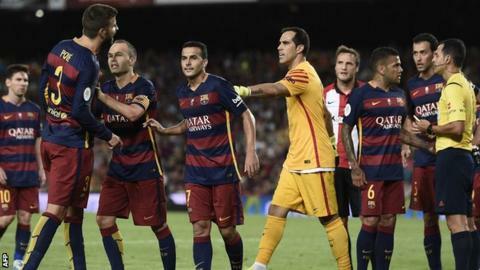 Barcelona defender Gerard Pique has been banned for four matches after he was sent off in the second leg of the Spanish Super Cup for insulting a linesman. The 28-year-old confronted the official during Monday's game against Athletic Bilbao early in the second half. The Spain international apologised on Twitter for his behaviour, but denied using insulting language. Barcelona drew the match 1-1, but lost 5-1 on aggregate. The club have not yet decided whether to lodge an appeal against the ban. Barcelona begin their bid for a sixth La Liga title in eight years at Bilbao on Sunday. Pique is certain to miss that match and Barcelona's game at title rivals Atletico Madrid on 12 September.